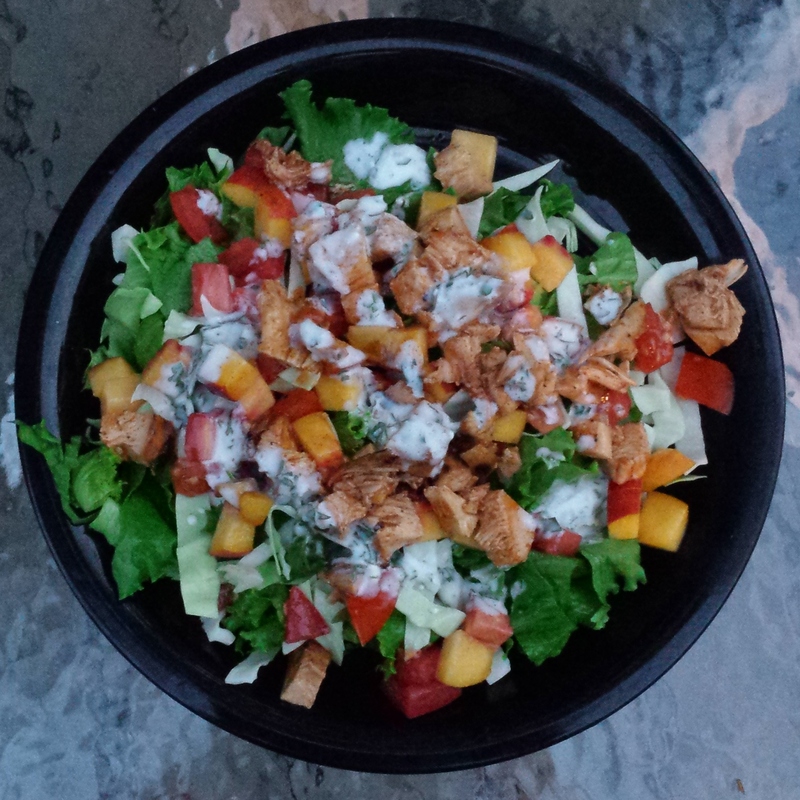 Barbecue chicken salad with tomatoes, peaches, and goat cheese ranch dressing. Christmas creep is by far the worst example, but I think the problem has gone way beyond just one holiday. It is more like seasonal creep now. It happens with businesses, beers, and food bloggers. The infamous hot pumpkin coffee beverage starts making its appearance at the end of August. I went to a grocery store and a craft store labor day weekend and was bombarded with pumpkin beer and Halloween decor. And this doesn’t just happen this time of year. Sam Summer goes out on shelves in March. Recipes for asparagus and strawberries pop up everywhere in March and April, even though their seasons aren’t really in full swing until June. Tomato dishes are everywhere in July, but their peak season is August and September (and it even goes into October). There is a push for always preparing for what is ahead, instead of enjoying what is here. A need to experience all the quintessential things that are supposed to happen in a season, instead of the reality. It is about to be October. I live in Massachusetts, and on Monday I went to the farm where I buy my produce and selected from summer squash, zucchini, tomatoes, eggplant, peppers, radishes, winter squashes, potatoes, kale, chard, beets, broccoli, cabbage, carrots, celery, leeks, onions and herbs. It is that wonderful time of seasonal transition, when both summer and winter crops are coming in. I still love my share of fall crops (though pumpkin does not get me nearly as twitterpated as everyone else), but my true favorites come from summer. The beauty in many fall and winter crops is they last a long time if stored properly. So I have many months to get in my butternut squash soup and beet salads, but in the meantime I’m going to ingest all the nightshades and stone fruit I can manage. Last week I made barbecue chicken, but wanted a lighter meal for the leftovers. A few peaches from peach week were still in the fridge, and since I’ve already put peaches and tomatoes together, and peaches and chicken together, putting peaches, tomatoes, and chicken in one dish wasn’t much of a stretch. This is easily scale-able. If you don’t eat chicken, chickpeas or cauliflower (a la buffalo cauliflower salad) would make an excellent substitution. If you have a food processor, set it up with the S blade (or use a blender). Turn it on and drop the garlic in from the top, processing until you don’t hear any more bits bouncing around. Add in the shallot, and process for 30 seconds. Add the goat cheese, buttermilk, salt, and pepper in and process until smooth. Without a food processor, whisk the garlic, shallot, goat cheese, buttermilk, salt, and pepper together. Then whisk in the parsley (don’t add the parsley into the food processor unless you want a very green dressing). Allow the dressing to sit in the fridge for at least 20 minutes, or longer if you can. Chop peaches and tomato into ½ inch pieces. Divide lettuce onto plates, then top each plate with a quarter of the tomatoes, peaches, and barbecue chicken (I like to warm it slightly). Serve with goat cheese ranch. This entry was tagged barbecue, chicken, fall, goat cheese, peaches, ranch, salad, summer, tomatoes. Bookmark the permalink.